Shakespeare’s Globe is finding bold ways to share the playwright’s work with global audiences. Shakespeare’s Globe stands just a few hundred yards from the theater’s original site on London’s South Bank. It was rebuilt to replicate as closely as possible what is known of the open-air 1599 Globe from Shakespeare’s own time. The new Globe Theatre opened in 1997 with Henry V and today is active during warmer months. During cold months the organization continues to produce work in the adjacent Sam Wanamaker Playhouse, named after the American actor who championed the reconstruction of the Globe during his lifetime. The organization reaches audiences globally both through touring and through its digital initiatives. The Globe Player allows desktop access to over 60 productions from recent years for a rental fee under $10 as well as a range of free content. In 2014 digital audiences were invited to follow a Tumblr page built to keep them abreast of the Globe-to-Globe Hamlet tour as it crossed continents and visited 197 countries on its two-year journey in celebration of Shakespeare’s 450th birthday. A Discovery Space provides access to a variety of learning and teaching tools, including Staging It, an interactive film maker that enables users to virtually stage a scene at the Globe. The Globe On Screen project transmits performances to movie theaters in Europe and North America or to home computers by rental. 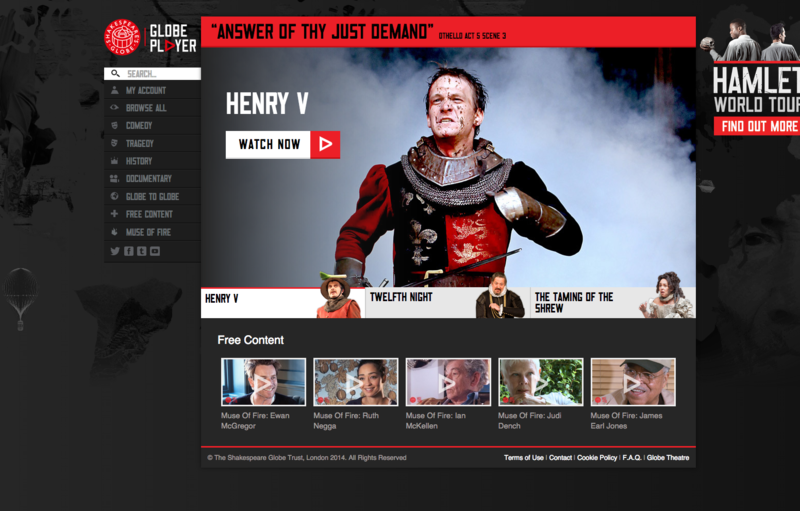 Playing Shakespeare is an unusually rich educators’ and students’ resource site offering background interviews, interactive projects and games that illuminate the language, themes, characters, and performance requirements for the Globe’s productions. Take a virtual tour to see what it’s like to be there in person.